CLARE COUNTY COUNCIL is seeking the public’s assistance in curbing the spread of Japanese knotweed. The invasive species can negatively impact native plants, as well as seriously undermine the structural integrity of roads, buildings and car parks. The local authority is asking the public to record all sightings of Japanese knotweed wherever they occur in order to assist in determining the extent of the infestation across the county. Clare County Council has said that recording the extent of the infestation of the plant throughout the county is “critical to tackling the problem and undertaking appropriate eradication programmes”. All sightings of invasive species should be reported to the National Biodiversity Data Centre – online or via 051 306240 or invasives@biodiversityireland.ie. 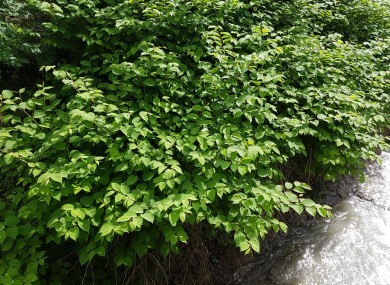 The council has organised a series of workshops on Japanese knotweed, facilitated by specialist Dr Frances Giaquinto, who has worked extensively in management of the plant. The workshops are free of charge and open to members of the public. “The aim of each workshop is to raise awareness, to help the general public to identify Japanese knotweed and related species, and to give them advice on what actions to take if they come across knotweed on their own property or locality,” Karen Foley, Environmental Awareness Officer with Clare County Council, said. Read: Not just the rhododendrons: What’s being done about invasive plant species in Ireland? Email “Clare is fighting back against spread of Japanese knotweed ”. Feedback on “Clare is fighting back against spread of Japanese knotweed ”.